The typical daily adult calorie intake is 2 to 3K. 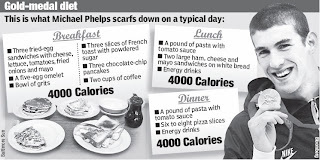 You would be enormous if you consumed 6K, making Phelps' diet even more remarkable. Chris, We have spoke with each other on Nathan's blog. I would like to meet with you if it is possible. Is there any way I can contact you without having to give out my own personal information first? My e-mail is theknightshift@gmail.com Feel free to write me there. As much as I love food, I don't even think it's physically possible for me to eat 12,000 calories per day. By the way, how long does he have to wait after eating that much before he goes swimming? Humor aside, how long DOES it take for all that food to metabolize into a form that he can have stored in his body to expend in these bursts? And something I wondered about yesterday: does Phelps have any kind of special diet that he will be on to "come down" from his Olympic high? I mean, to automatically go from such a high-calorie, carbohydrate-rich steady intake to a normal diet might cause a huge shock to Phelps's system. There are cases recorded in the final days of World War II when American G.I.s would liberate Nazi concentration camps, and the well-meaning soldiers would give candy bars to the prisoners. The Jews and others who had been held captive were so emaciated (most being given only a few hundred calories a day while they were being held prisoner) that some of them went into coma and even died from the shock of all that sugar suddenly entering their digestive system and bloodstream.